Electric Vespa Reimagines Classic Italian Vehicle With a Futuristic Spin. 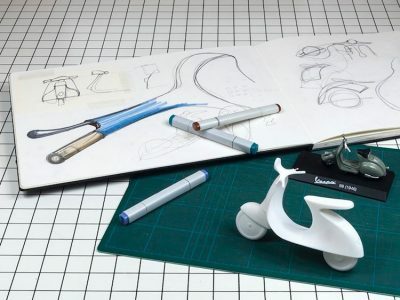 Italian industrial designer Giulio Iacchetti gives approval to the original 1946 Vespa with his concept for a sleek, minimalist electric bike. The beloved Italian scooter is reimagined as the Vespampère, with Iacchetti linking past and present for a forward-thinking vehicle designed for better riding in urban environment. A built-in smartphone holder recharges your phone while keeping it protected from the rain. And the speedometer, fuel gauge, and lights are accessed through a wireless app. At the same time, the designer maintains classic elements like the front circular headlight and cleverly integrates turn signals into the rear-view mirrors. Overall, Iacchetti has put an interesting twist on the Vespa, a classically Italian scooter born from the necessity for affordable transportation in post-World War II Italy.